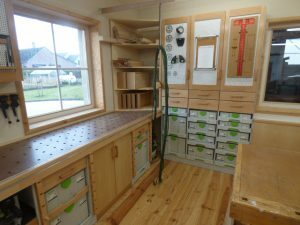 After finishing my new workshop in 2015, I moved in quickly with my previous workbenches and cabinets to start working again for customers. 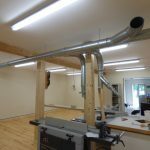 My previous shop was very small, I had a 4x5m room for all my assembly work and workbenches. This time I had a room twice as big but I was stuck with the same small benches and a dire lack of storage options, most of my toolboxes were sitting on the ground against a wall. It’s only at the end of 2016 that I was able to make time for the workshop again and build what I had originally planned. Below you can see my new workbench, I was in dire need of more workbench surface so I could streamline production, this allows me to sand on one side and do routing or assembly on the other. 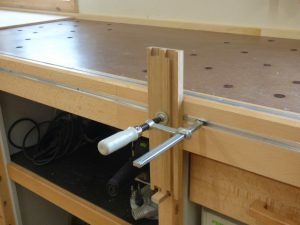 When I am sanding I always place an anti-slip mat on the workbench that I keep in place with rail clamps. This protects the work piece and absorbs vibrations and noise. This mat is long enough to cover the entire workbench, later on I plan on building a roller at the end of the bench to roll it up. 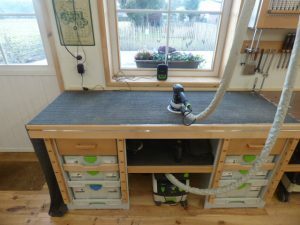 Note how the shop vac fits under the bench and the shelf above where you can rest the sander or other tools. 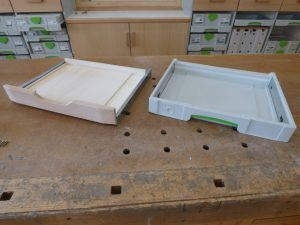 Below you can see the drawers on the sanding end, one serves for storing my most used sand paper by size, and in the other I keep the worn out sanding pads which I cut into 4 and use to sand by hand. 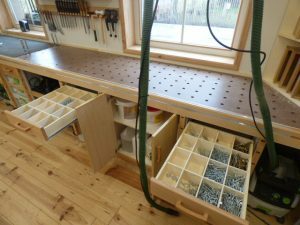 I have always done this but never had a dedicated storage option for it, so they would clutter the workbench. 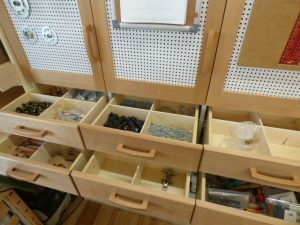 On the other end I do assembly work or power tool operations, the two drawers on that side are dedicated to screws and I turned that mid section into a closed cabinet where I keep my glue buckets and other products. This way I have all sizes by hand and can see what type I need to order again before I run out. These dividers are made on the table saw with a dado cutter. 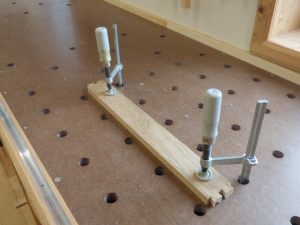 Below you can see the numerous clamping options offered by the holes on the worktop, the rails on top and front of the edge and the perforated legs. Virtually nothing is impossible to clamp. 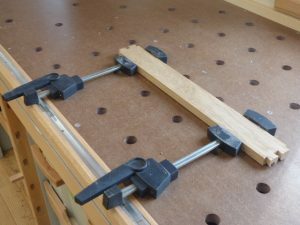 Note the wooden pegs inserted into the front legs that serve as a stop for panels or pieces clamped to the front. I also designed a little platform that offers a bigger support, some work pieces are too long when placed upright on a workbench, for example when sanding drawer fronts. 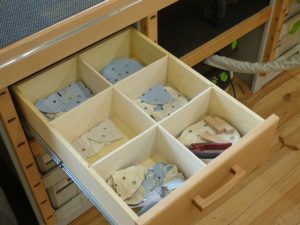 This was major annoyance in the past as it’s not unusual for me to have dozens of drawers to sand or on whom I must attach handles. 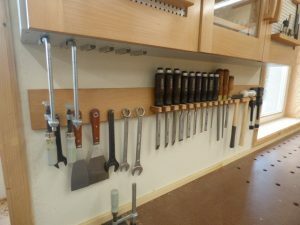 Something I was also missing in my new shop was a tool cabinet above the workbench where I could store all the small hand tools and accessories frequently needed. With this cabinet I have all that within hand reach. 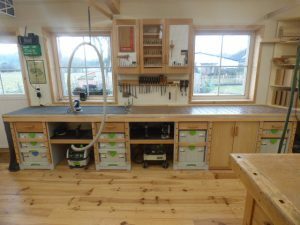 In the centre I keep my most used drill and router bits on little removable shelves that are angled forward, I used the same feature as on my shaper cabinet. The left and right doors are filled with peg boards, that way I can easily attach tool holder from behind and eventually change them later on without leaving any traces. I keep the small glue bottles in one end within hand reach. 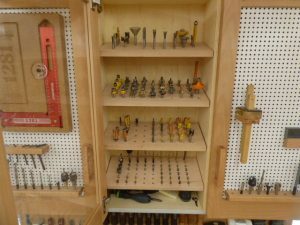 Below the cabinet I made a rack for the different tool I often use, like router wrenches, chisels, hammers or clamps. 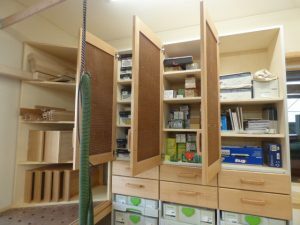 Initially I didn’t know how to intelligently use the corner where the workbench and tall storage cabinets would meet, an actual cabinet in that spot would be hard to use and an open space would be a waste. Thankfully I came up during the final planning with a shelf that I could use to store all the different pieces of the furniture I would be working on. Up to now I used to lay these on the workbench which would often take up the entire bench surface, or I would lay them on the floor which made them prone to being damaged and created a mess anyway. 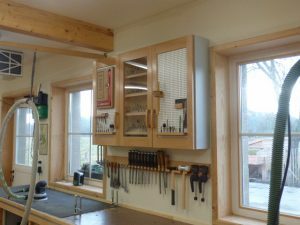 On the other wall of the shop I built cabinets to hold my systainers and store all kinds of hardware and supplies. This design is inspired by existing designs, often based on the “chaos theory” by Guido Henn. The basic design is so perfect that there is basically nothing to improve. My only problem was that the original design had a complex and expensive build process that used a large quantity of panels and expensive hardware. So I designed my own version that uses pretty much half as much panels and basic cheap hardware. 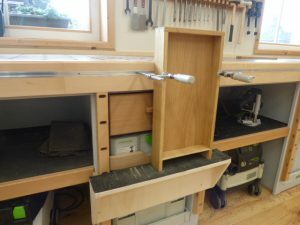 Drawers in the middle section for hardware. And systainers in the bottom section. 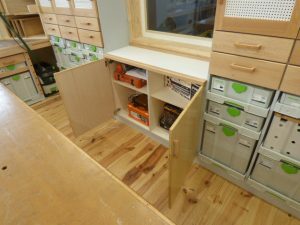 To use the space under the window I built a cabinet where I can store things that are too long for the other cabinets, in this case my Trend dovetail jig or case for the nail gun. 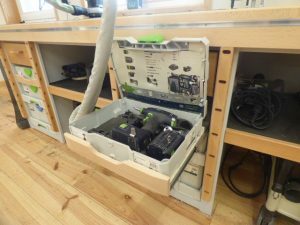 You will have probably noticed that I mostly used the SYS-AZ drawers sold by Festool, I had planned on making my own drawers to keep the budget low, and had already purchased all the slides, but I wanted to make my design and plans compatible with the drawers by Festool. So I simply sent Festool Belgium an email, asking if they could perhaps lend me a few. If not I would have bought a box of 5, but to my surprise they did not only agree, but they sent me 30 drawers I could keep. Companies have a marketing budget they can spend on such actions, as in this case they will obviously get publicity and views in exchange. But in any case a big thanks to Festool Belgium! However I still made a homemade drawer for my plans and to fill the last remaining open spots. 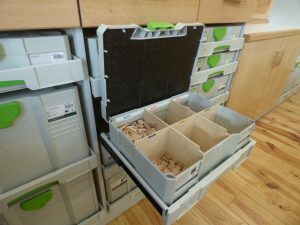 It helped me discover that the SYS-AZ drawers are in fact much better thought out than I originally thought. The first thing you notice is the limited height, the SYS-AZ drawers have a thin plastic bottom and so only add a few mm in height to the systainer. The wooden design is de facto 14mm taller, might not seem much but it adds up. With the wooden drawers you can’t place as much systainers in the same space as with the SYS-AZ. Another advantage is that the sides of the SYS-AZ cover the slides, and so prevent dust and other particles from getting stuck in the grease and around the balls. In a workshop I can imagine they will run smooth for much longer. And finally they come with a lock you can install in the 32mm system holes and that locks them in place, it’s not useful in this case but on a rolling workbench or in a vehicle it is a very handy feature. 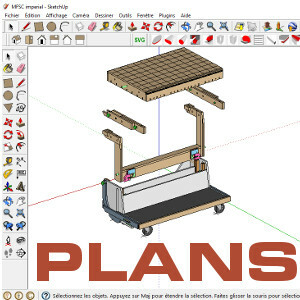 I made plans in English, French and German that detail the construction step by step for each of the pieces shown above, with a material and cut list. It also contains the 3d sketchup model. 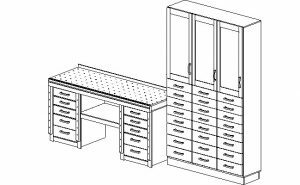 The plans are 39 page long .pdf and detail the build of the workbench, storage cabinet, tool cabinet and low cabinet. For the US market I made an English version where I used imperial sheet goods, note however that the plan is still in metric dimensions, but with sheet goods in imperial thickness. Here is a list of tools that I used to build this project, some are required (R) and other are optional (O) you need the Required tools but you can build it without the Optional tools, they just make it easier. 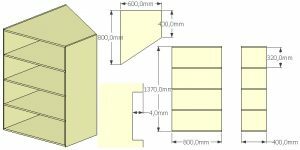 Also important is that you can still use these plans if you have no/not enough systainers, the drawers in these designs can be used to fill all the systainer places as seen on the sketch below. 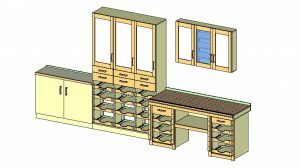 In the sketchup plans I also added 2d models of the workbench and cabinet where can can play around with the drawers or systainers of your choice and see how you can sort them out in the best way. There is one for the SYS-AZ and one for the homemade version. 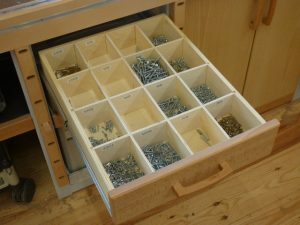 Below is an example of how the workbench cabinets can be sorted out with SYS-AZ drawers. Hi Tim, fog member and follower here….just wanted to post to say you convinced me on the sys-az ….makes perfect sense and I’ll be buying them…so Festool (Bel) did the right thing knowing they would be displayed by you and shown their advantage ! Thanks and thanks for all you share. Thanks for the message Von, the installation of these and build of the homemade ones will be shown in the 3rd video. Fantastic setup, thanks for sharing. I am buying the plans and adding this to my new shop, super excited! Thanks Scott, make sure you send me pics of the result! Timothy…always love to watch you build. This shop is outstanding. Two questions. 1. Did you use the 20mm Euro hinge bit for the holes in your top? 2. What exactly is the wax product you wiped on the top…I’m wondering if it available in the US. Thank you. Hello Donna, I used a regular 20mm straight router cutter from CMT, theirs have cutting faces on the bottom so you can make plunge cuts. I had to look up those hinge bits, I guess those would work as well. I used hardwax oil from Ciranova, it’s similar to Osmo for example. 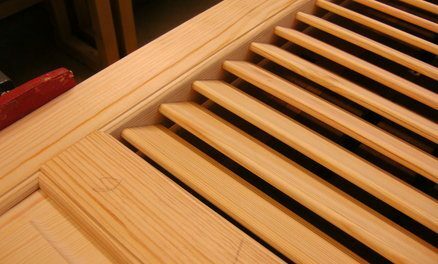 It’s normal use is for hardwood floors or stairs, so it’s very durable. Just sent you a direct link, thanks in advance. I’ll send you a payment request by email. Can you send me a payment request via email too? Hi Tim, thanks for your heart to share your workshop experience with all of us. Its such a pleasure to watch without speech. So many spend hours behind their bench talking about stuff before doing it. You get on and demonstrate straight away – love it! Congratulations on what you have achieved in woodwork, and on the completion of your amazing workshop. I’m a retiring airline pilot who has had a deep passion for woodwork over decades, and love spending time with broken people who just a need a hand up in life. Ive found the workshop environment a fantastic place for people to be able to offload and get quality help. I’m hoping to set up a similar workshop to yours, in the hope of enhancing this. My last workshop was about 94m2. I’m busy designing a new one at a new location. As a matter of interest, what are the sizes of the different areas you have. I like the space you created between machines. 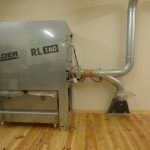 11x10m for the machine room, 5×7,5 for the assembly room and 5×3,5 for the finishing room. I think I found a good balance that gives each stationary machine and each dedicated area sufficient space. Adding walls in between sections gives you precious wall space for benches or storage, racks etc… It’s also easier to contain the propagation of dust, noise or accidents when working with others as you plan to do. fournisseur qui vend des panneaux de CP de bonnes qualités. Merci pour les compliments Valentin, pour les panneaux je me fournis principalement dans un commerce indépendant local. Du moment qu’on évite les grandes surfaces et bricolages on trouve généralement de la bonne qualité. VERY impressed! 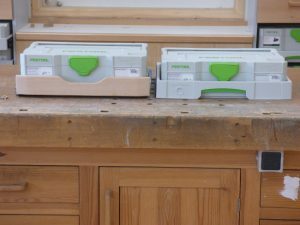 I need to build homes for my ever-growing Festool collection – and I have some of the drawers, so I am ready to move forward. 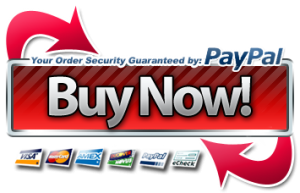 Love your concepts – I ALSO had trouble purchasing the plans – when I click CHECKOUT, it says please wait without moving forward. Your lab is a wonderful job. I’m a bit envy. 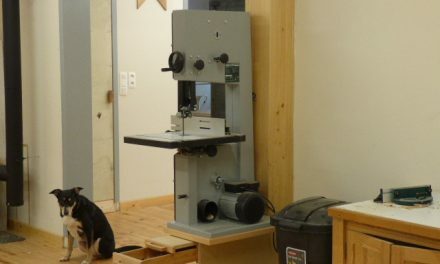 Btw I have a 40 m2 lab but only 3-4 hours a week to dedicate to woodworking. I’m impressed by your set of festool tools. I’d like to know where you purchased guides for drawers and the t tracks. Sooner or later I’ll buy some of your plans. Link to buy plans doesn’t work. Can you tell me what it says? I can also send you a direct link if you wish. I like your Workshop 👍🏻😉 Great Work, well done. You Must have a Instagram Page to Show your work. Just purchased the plans from you. It said payment was successful but then nothing. PayPal shows the transaction is complete. The plans are not opening or showing to be available to me. great job. 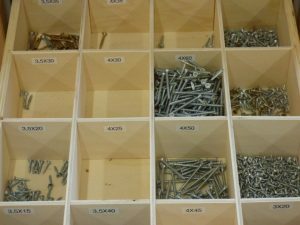 I’ve got a question what kind of drawer slide did you used wich brand? hope to build a shop ljke yours in the future it’s so well organised. Great video’s and also great plans. The labels on your Felder equipment gave me a hint about your location. Good to know I can ask somebody for advice without having to rely on foreign webshops. I am curious about the drill specification you are using. I have a T15+3 set and a CXS set, been using those for nearly 6 years now, still going strong on the original batteries. But now festool has a range of 18v tools so if I were to choose again, I’d take the T18 to have 18v batteries. 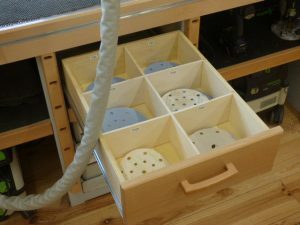 What kind of sliders did you use for making your own SYS port drawers? I used full extension slides, 350mm long. 35kg I think. Do you know if they’re compatible with Bessey clamps for t-track sold in the same website? Are those clamps a kind of standard in dimensions? I see you use the Festool ones. I double checked in the technical information reported in the page (apparently only in German 🙁 ), and I’m not sure if they fit. My compliments for your recent project of the MFSC. It’s fantastic. I am Dominik from Germany. 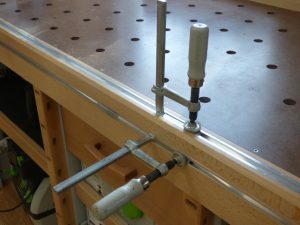 You can use the Bessey clamps (BE-GTR) for the t-track as well as the Festool clamps (FSZ-120, FSZ-300 and FS-HZ160). They fit all for the t-tracks. Appreciate your time and effort creating the plans and videos. Love your shop. As it is, I’ll be moving into a new place that has a huge shop area like yours. It has a cement floor and was thinking of putting a laminate down. What is your flooring made of, and did you put a thin insulator between the base and top? 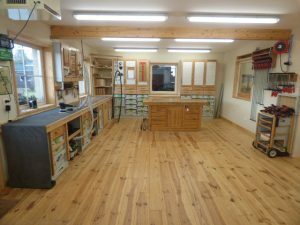 Hi Jim, on my youtube channel there is a video about the flooring of my shop, I wanted solid pine. Because the concrete below was uneven and hard for my knees. The concrete has a plastic barrier underneath so I didn’t put anything else, the best would have been something like OSB panels and then floor boards, to make it more stable and sound less hollow but I didn’t want to spend so much more for that. With laminate you’d need an underfloor, my main reason for selecting solid softwood is because it’s softer for the joints and doesn’t contain formaldehyde like laminate does. I’m gonna place the order on saurershop. 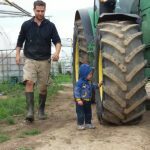 unfortunately in UK we are limited on garden space so bigger workshop not possible. thanks for sharing you have some great ideas and inspired me to change a few things in my shop. 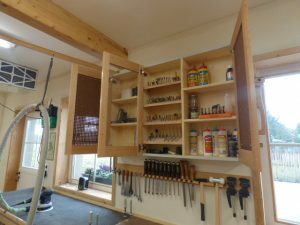 I’m building the tool cabinet right now and am wondering what hinges you used. Blum are $20 a pair at rockler, not sure if they are right. Plans are great by the way! Blum is a top shelf brand, made for intensive use but you often pay for the design as well, which may be overkill for a workshop. I personally use Salice which is what my local dealer has in store. I recall they cost around €5 a pair and I have never worn one out. Made a mock up and it covers entire frame edge. Looked at salice on Amazon, not sure which one to get. 1/2 inch overlay or half overlay. It’s the half overlay you want, the kind that allows you to use two doors on the same 18mm or 3/4 inch panel. Can’t help you with a part number unfortunately, the ones I get come without packaging. Now to be honest, you only need half overlay for the middle doors, the others can use full overlay. Just adapt the width of the exterior doors so that you don’t have a gap. Do all drawer slides match hole locations you have on your plans? Hi Chris, they should match yes if you follow the plans. I don’t see a table saw in your shop. I am trying to design a small garage workshop with limited space. Do you simply use track saw for most stock cutting? I do have a panel saw in my shop, it’s in the room next to my assembly area. I have a track saw but don’t often use it in the shop, it’s mostly for exterior work or an odd task here and there. 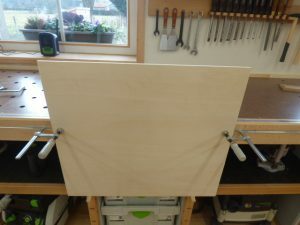 But if you don’t have the space the it’s ideal in combination with my MFTC mobile workbench, it can be folded up and the extension tables used for cutting down complete sheets. Hi, loving your blog. can the top be replaced easily? Looks like there are screws in the face holding it down so I assume you don’t do any cutting directly on them. Hi Timothy is it possible to ship jewelers bench to US? It is, but shipping costs are so prohibitive that it never goes through. avez vous arrété les vidéos et si oui pour quelles raisons ? hi Timothy, are your projects still for sale? Yes they are, let me know if there are problems. Hi Timothy, I finally finished one of the glue/sanding tables based on your plans. I shared in the North American FOG Facebook page and you should be getting more business to buy your plans. Thanks again for the great design. I will continue to build the next section.